Synopsis: An insane general triggers a path to nuclear holocaust that a war room full of politicians and generals frantically try to stop. 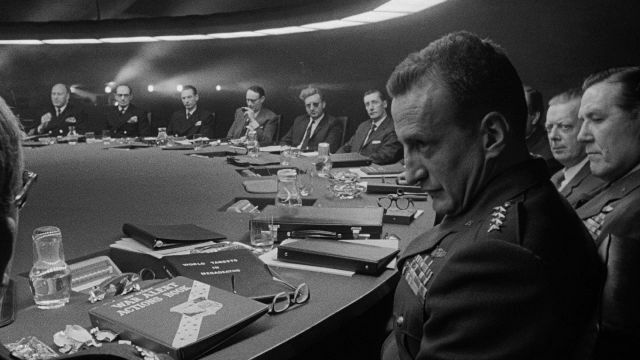 Most of the action in Dr. Strangelove takes place indoors, either in the War Room or the office of paranoid Army officer Jack D. Ripper (Sterling Hayden), who sets the world off on its path to destruction. Hayden, whom Kubrick persuaded out of retirement, is perfectly cast, his sagging, rugged features a tapestry of mistrust, the pinpoint light in his eyes revealing the insanity behind them. The claustrophobic low ceilings of his office, the sterile vastness of the War Room, the confined spaces of the B52 bomber and the brief glimpses of a cold, unpopulated world seen through its windows all combine to create a strangely alien atmosphere, as if the war the characters so frantically try to avoid has already taken place. Everywhere is seen the slogan ‘Peace is our Profession’ a slyly cynical phrase suggesting that peace is something that can only be acquired after years of study and toil, and which is exposed as a lie as we witness US soldiers mowing each other down in its shadow. Peter Sellers takes on three roles here, something which would normally count as a major drawback in my book, but he’s actually quite good here – which is quite ironic given director Kubrick’s tendency to encourage his actors to overact. Only his title character demonstrates Sellers’ propensity for self-indulgence, as he wages a protracted battle with an uncontrollable arm that insists on giving a Nazi salute. It’s a routine that quickly grows tiresome, although the rest of the cast apparently thought it was hilarious, which is the reason Kubrick employs so many cross-cuts for this sequence. 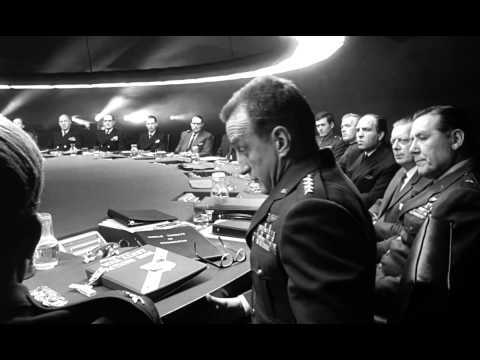 Sellers’ depiction of the superhumanly calm President Merkin Muffley is bang on, however, and his conversations with his Russian counterpart Dmitri are amongst the funniest one-sided conversations ever recorded on-screen. Dr. Strangelove came out in the same year as Fail Safe, a dark thriller in which virtually every incident from Strangelove is repeated – although they are adapted from different novels – and it’s worth trying to watch them as a double bill to see an identical message delivered in such contrasting, but equally impressive, ways.